Tape backup; boring, uneventful, necessary. Nothing splashy or exciting about the oldest backup medium. Why is it still in use? Tape is reliable, relatively inexpensive and gets the job done. 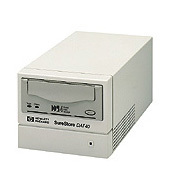 Most businesses running a server use a tape drive for daily backup of important documents, system files, what have you. Still don’t see the need? Say your business works on important documents every day, making daily changes. Something goes wrong and you need a copy of a file from six days ago. Since you overwrite the file on the server daily, where do you get the file you need? Go to the tape and retrieve it. My office needed a new drive, as our old Exabyte 8 GB had given up the ghost. I did an [intlink id=”2314″ type=”post”]extensive look[/intlink] at various drive specs and manufacturers and decided on the HP SureStore DAT40e. With a 40 GB compressed capacity per tape and 20 GB / hour transfer rate, this drive would fit our requirements. As well it supported a feature called One Button Disaster Recovery, which I’ll describe later. I’ve used the drive for a few months and have run some backup tests, so let’s look at this product in detail. HP offers the SureStore DAT40 in two models; internal and external. We’re looking at the external model. While the drive is labeled as DAT ( digital audio tape ), it’s really DDS ( digital data storage ). It’s a development of the DAT system, but has evolved quite a bit. Unfortunately it’s widely speculated that the DDS format has reached the end of it’s life. Luckily for us it fit the bill nicely. Upon opening the box I found: external drive, 3 foot 68 pin SCSI cable, 68 pin SCSI terminator, power cable, installation manual, user manual, HP SureStore CD, Yosemite TapeWare CD, DDS-4 tape, DDS cleaning cartridge. The drive is about the size of three stacked VHS tapes, but weighs in at 4.6 lbs. On the front are three LEDs: tape, clean and power. Lift the front flap and as you start to push the tape in the drive grabs ahold and brings it in. Operating noise isn’t too bad, but in general all tapes drives make a fair racket. The DDS tapes are very small at roughly 3x2x.5”; I’m used to the old 8 mm or Travan tapes. Installation was straight forward. SCSI ID is set on the back of the drive, so I chose a free number and connected the drive to the Adaptec 2040W SCSI adapter in the server. The server is running Windows 2000 Server, which proved to be a bit of a problem. The HP SureStore CD that’s included with the drive comes with some interesting utilities such as TapeTools and TapeAlert, but nothing on the CD was able to handle Windows 2000. I couldn’t find a date of manufacture on the drive or packaging, but it was purchased eight months after Windows 2000’s release. I checked the HP web site and found updated drivers, software for Windows 2000, which I downloaded and installed. Unfortunately I couldn’t find a Windows 2000 copy of TapeAlert, so I’m missing out on remote network management of the drive. I installed the HP TapeTools and Yosemite TapeWare backup software. TapeTools is “ a whole lot of feathers but not much chicken”. It gives specs on your drive, does basic tests and checks and updates firmware for the drive. I was in need of the latest firmware, so TapeTools told me, so I used the download feature and was done. Yosemite TapeWare is an easy to use backup software. I installed the base product, and then had to install the One Button Disaster Recovery from the same CD. It’s part of their optional features, just like autoloaders. It’s wizard driven and very easy to follow, providing backup, restore, scheduling, and comparisons of data and removable storage. It can be managed across a network and does a good job of it. HP includes it with all SureStore tape drives. I’ve run some benchmarks with Windows 2000 Backup and TapeWare. I created a test folder with 184, 989 files totaling 11.63 GB. I then backed up the folder and restored it to the original location. To recap the DDS-4 specs, it’s supposed to have a transfer rate of 3 MB / second uncompressed and 6 MB / second compressed. For Windows 2000 Backup, a backup took 63 minutes, giving us a transfer rate of 184 MB / minute or 3 MB / second. Restore took 89 minutes, giving us 130 MB / minute or 2.17 MB / second transfer rate. This is with hardware compression enabled. Unfortunately TapeWare seems to add quite a bit of overhead to the backup process. It performs a full backup, then does a verification pass. I found this odd, since DDS-4 drives use “verify after write”, which eliminates the need for the software to do a second pass. This feature can be disabled, but is on by default. It only managed, at best, 51 MB / minute or .87 MB / second. While that is slow, TapeWare is designed for ease of use and reliability, not speed. To use the One button Disaster Recovery ( OBDR ), you have to follow the instructions provided in the OBDR User Guide. Basically you hold the eject button as you flip the power switch. Then power on your PC and insert your recovery tape. The tape then acts as a bootable disk and you load up your system from tape. Of course the backup had to have been done with software that supports OBDR, such as TapeWare, Veritas Backup Exec and CA ARCServe. Plus your system has to be booting from the SCSI controller the tape drive is connected to. Those in the market for a solid tape drive should give the HP SureStore line a look. Editors note: this review was migrated from the old eBabble.net site and the photos updated. Originally published June 11th 2001.